Hello all! When I decided to blog about author websites and blogs, I realized there was no way I could fit everything into one post. Not if I wanted to go into detail. So I decided to turn it into a series. Today is part one and we’re talking about getting started. I’ve been creating my own websites since the 90s. Anyone remember Geocities, Tripod, Angelfire? Yep, I used them all. Back then, I created everything in Dreamweaver and uploaded via ftp. Keep in mind, I knew next to nothing about html. But where there’s a will, there’s a way. I played around with site building on and off, creating graphics, trying new styles and platforms. And then came the time to put those skills to use. I had just signed my first contract with a publisher and I needed an author platform. Before I could think about Facebook or any other social media, I had to establish an author homebase. At the time, I had no idea what a blog was or what it entailed. A friend told me about Blogger, so I shopped around a little and went with Blogger. Slowly I started customizing, looking for themes outside of what was offered which would fit my needs. After that, I started playing with widgets and html. Google became my best bud. Anything I wanted to do but didn’t know how, I Googled. Everything I did with Blogger prepared me for the upgrade to Wordpress, but I’m getting ahead of myself. With today’s technology, building your own website is much easier than it used to be, with website builders doing most, if not all, the coding for you. You don’t have to spend hundreds or thousands on a website. I know I certainly couldn’t afford to pay someone to build a site for me, and as I was just starting out, I couldn’t justify the expense. Though it’s far less expensive these days to get a really nice site designed for you. But this series is for authors who want to do it themselves. Tip: It’s never too early to start your author platform. Once you get published, you’re going to be busy with a billion other things: edits, galleys, production forms, marketing, promotion, and everything else. The more you have already done, the more you can concentrate on your release and your writing. It’s much easier to update your website once you’re published, than it is to build it up from scratch. There’s a great deal of information you can include regarding your work in progress, your journey as an unpublished author, etc. So where do you start? There are plenty of free website builders out there. I highly recommend having a website with a built in blog. If you already have a blog, let’s say with blogger, and you’re going to build your website in Wordpress, I would recommend linking your blog to your Wordpress site via your menu. I’ll be getting into that when we get to the design portion of the series. 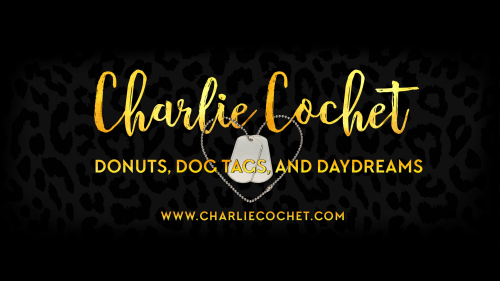 When I decided to move on from Blogger to a website builder that was both easy to use and allowed me the freedom I wanted to customize, I tried out a few different builders: Weebly, Winx, Web.com, and a few others I can’t remember at the moment. They weren’t the right fit for me. Don’t be afraid to sign up with these free web builders and play around with the building tools. If they don’t work for you, delete or close the account. Obviously you don’t want to link a domain name or start sharing links before you’ve decided whether the builder you chose is right for you. After trying several builders, I went with Wordpress. Now, there’s a big difference between Wordpress.com and Wordpress.org. Wordpress.com is rather limited in what you can customize, but again it depends on what you need and how much you want to change or be in control of. With Wordpress.com, if it’s not available in the theme you choose, there’s not much you can do, and certain types of coding won’t be permitted in your widgets. It also doesn’t allow plug-ins. Wordpress.org allows you to upload plug-ins, customize html, and use scripts in your widgets. It’s not self-hosted like Wordpress.com which means you’ll have to have web host. If you go this route, make sure you do a good deal of research before choosing your host. The problem with cheap web-hosting is that the space is shared (unless you opt for the more expensive dedicated servers), so if your site uses up a lot of memory and causes spikes in their CPU, it will be shut down until you sort it out, and let me tell you, your blood pressure will skyrocket while you try to sort it out. With the amount of websites growing, companies providing shared web-hosting are overselling space on their servers. You don’t want to have the constant hassle of your site going down, so ask around and find a trusted web host. I’ve been told Dreamhost, Hawkhost, and Stablehost are good places to start. Next Monday: Author branding. 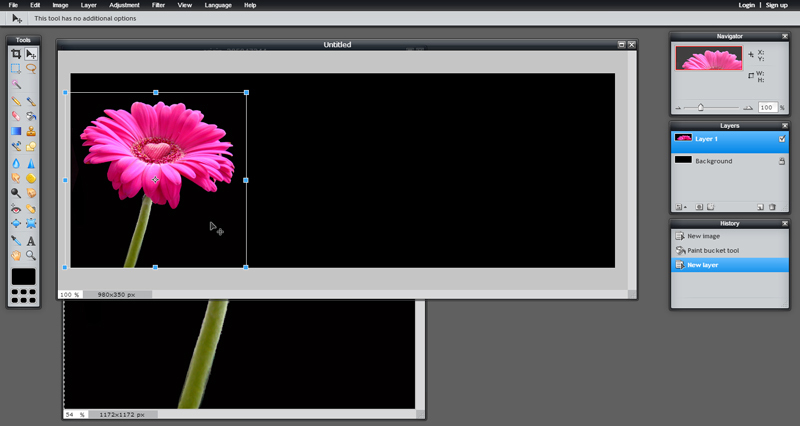 I’ll also list those free online image editors, since it’s relevant to coming up with your author/website brand. Have any questions? Just leave them in the comment box below. Hello all! 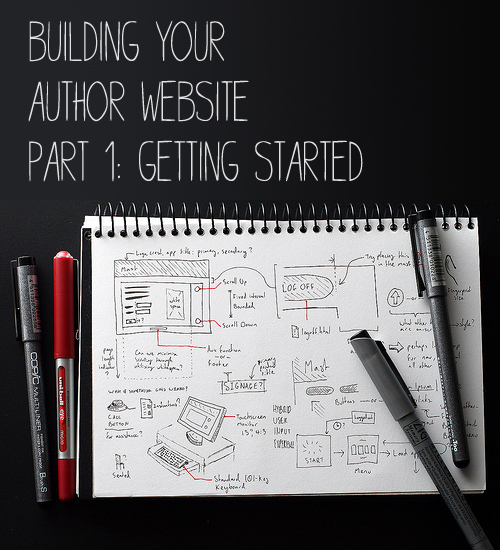 Last Monday we talked a little about getting started on your author website. We discussed picking your platform and looking into hosts, the difference between Wordpress.org and Wordpress.com (for a more detailed comparison, you can go here). Today I'm going to go over some of the essentials. Before I started my website, I visited hundreds of author websites. Not just in the M/M Romance genre. I looked up authors from various genres, from the big names to brand new authors. I checked out their pages, made a list of what I thought were key elements. I also spotted a lot of things missing which were they implemented would make their sites much stronger. I also did a poll where I asked readers what they wanted from an author's website. Why? Because: Your website is not for you. It's for your readers. I think that's where some authors go wrong. You author website is your hub. Your online home. It's where you give information and connect with readers. Everything you provide should be done so with the reader in mind. You'd be stunned by how many author sites I came across that didn't have a Books (or similarly titled) page. I heard you gasp from here. 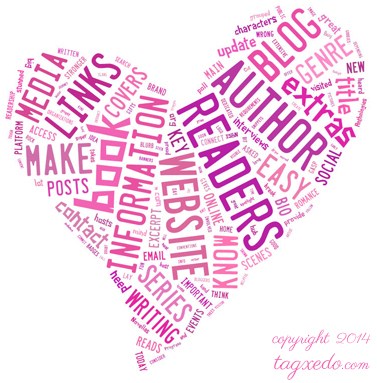 Your blog should also either have a Books page or a link to your Books page. You and your current readership might know what you've written, but what about new readers? What should you put in your Books page? It's up to you how you lay it out, but whatever you do, make sure your information is easy to find and clear. "Books" is a listing in my menu. It's a dropdown menu. I have a "Book List" page with all my titles, grouped together by series. Each cover takes you to that book's page. In the dropdown menu, it's broken down into categories: "Series", "Novels", "Novellas", "Short" "Stories", and "Anthologies". Under the "Series" heading, you'll see the list of all my series, and each one will take you to a page with information on all the books in that series. Under "Novels", you get a menu with my novels by title. You don't need to have as many pages as I do. It's just to give you an idea of how I break things down. It gives readers a choice of how they can search for my books. An excerpt or link to an excerpt on the publisher's website. Additional information: Have you had some good reviews or testimonials? Why not include them to let readers know how your book is being received. Have you received any nominations or awards for your book? That's something to be proud of. Is it a best seller? Include badges with your books. Book Extras: Do you have some fascinating research you came across while writing your book? Is there a story behind the story? Why not include a Behind-the Scenes, or Cut Scenes. Extras are little gifts for your readers. When I love a book, I want to read everything about it. Another page that's essential is an "About" page or "Author" page. You want to tell readers a little bit about yourself. Have a fun Q&A or tell a little story about yourself. Let readers get to know you. Do you have an interesting hobby? Did you used to be in a rock band? Are you a goat herder by day? I was (and still am) surprised by the number of author websites I came across that either didn't have a contact page or it was at the end of some extensive maze of links. I have a dedicated email address I give out to the public. If you don't want to sign up for another email address or give one out, you can add a contact form. In wordpress, Jetpack has a super easy Contact Form you can set up and you decide what the requirements are. Readers should have a way to get in touch. Fellow authors might want to get in touch, or award organizations, blogs, etc. Social Media: Make sure your social media links are visible and in several places. Each reader will come to your website from a different place. They may go straight to your blog, to a certain book page, to your main page. Wherever they go, you want to make sure your social media links are available. Whether they're in the form of icons or links, you want them in as many places as possible. If they're in your footer, they'll appear on every page. In your sidebar-depending on how your site is set up, it might be the same. Add them to your contact page. Media: As an author, you're likely to get involved in the media, whether through guest posts, interviews, radio interviews, blog tours, etc. You want a place to put these so readers can check out these great events. Press Kit: A press kit includes information about you and your books which can be used by others for media purposes. Bloggers, reviewers, anyone who posts media might need one of your book covers for a review, or your bio for a spotlight post on you. You want all that information to be readily available and easy to access. Usually online press kits include an author's bio, author's image, logo, banners, book covers, links to books, links or snippets of reviews, awards, testimonials. It's up to you how much to include, just make sure it's all neat and easy to access. Let readers know what you're working or what's coming soon. This is especially helpful if you're writing a series. Readers will want to know when the next book is coming out. Many authors like to offer extra goodies, such as free reads. Maybe you're also an artist and draw pictures of your characters, or create crafts related to your books. Maybe you knit. Your extras page can include anything you like. Do you write a specific genre? Your extras can include interesting info on that genre. I write historicals set in the 1920s and 1930s, so as part of my extras, I've included a slang glossary. You can include character bios, family trees. Do you attend conferences or conventions? Let your readers know where they can meet you. Book signings, appearances, meet and greets. Do you have a newsletter? Where can readers sign up? Make it easy to find. Don't just stick it at the bottom of your website. I have my signup form in widgets on the bottom of my website, on the sidebar in my blog, and as a link in the menu. That way readers can find it easily whether they're on the main page or the blog. It's been shown that websites with blog get more traffic. It's up to you whether you can commit to a blog. Blogging is tough, no doubt about it. You not only have to decide what kind of content you'll be blogging about, but who your audience is. You have to keep it going. Having a blog is a great way to interact with your readers or just let them follow you along your writer's journey. Whatever extra pages you decide to have is up to you. It's important you make information clear and easy to find. Don't make visitor's to your site hunt for what they're looking for. Also very important: update! Even if you don't have the time to update often, don't let your website fall behind months or even years. When I come across an author whose site hasn't been updated in a year, I wonder if they're still writing or if they've moved websites. 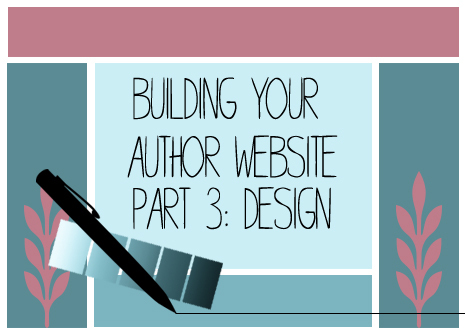 Next Monday is the start of the Hell & High Water Blog Tour, so Building Your Author Website Part 3: Design will be posted early, on Sat the 28th. 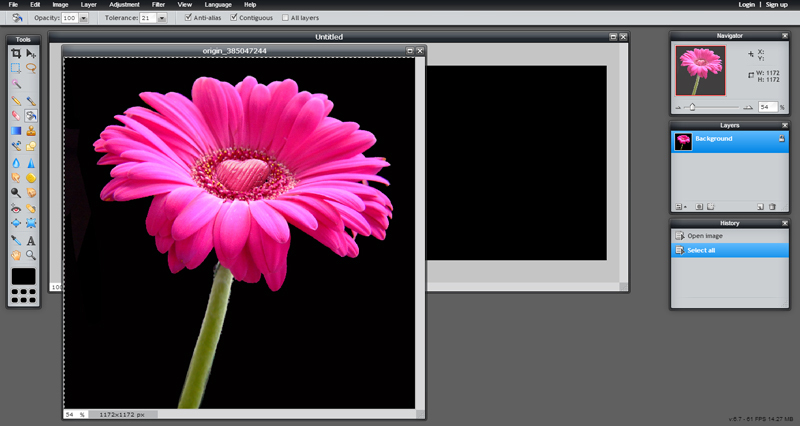 I keep promising you those list of free online image editors, so here they are. Next installment, I'll tell you a little about using them to design your website. Hell all! Welcome to this week's installment in the Building Your Website series. 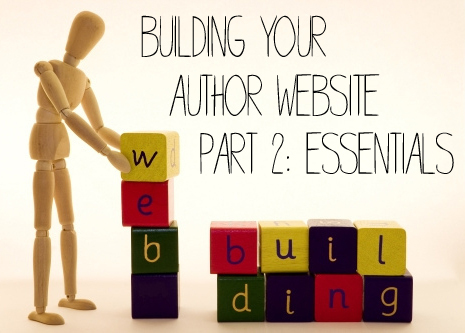 As I've mentioned in Part 1-3, building your own professional website is easier than ever. 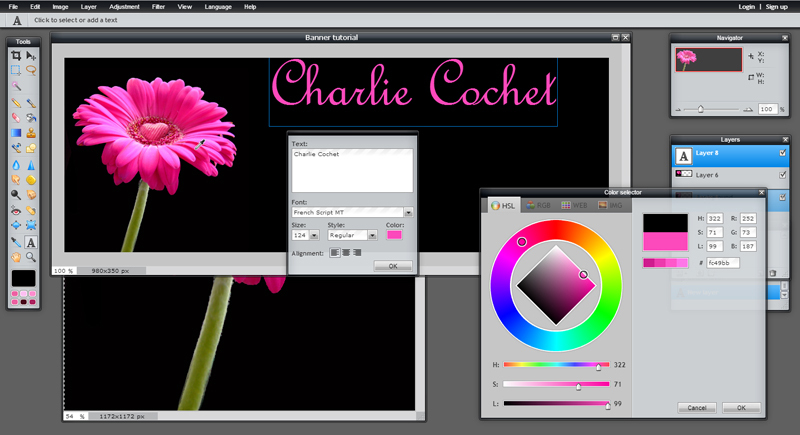 Once you've chosen your platform, as we discussed, and you've started designing it, you want to add your own graphics. Believe it or not, making your own graphics isn't as hard as it sounds. It only takes a little practice. When it comes to the graphics on your site, it's best to have as much original content as possible. I create all my graphics, some of it from scratch, some using stock photos. I also always try to use purchased stock photos rather than free stock photos. If it's for graphics that will be used for a blog post or something small, then I tend to use free images and give credit. For you website's main header banner, you'll want something original, which means either creating from scratch or buying graphics. Compare stock photo sites, some are cheaper than others. Make sure to read the site's Term & conditions, as there may be restrictions on how they allow their photos to be used. Most won't allow you to take an image and turn it into a logo. Dashboard > Appearance > Header. Where it says Select Image, you'll see your banner dimension. Let's use Pixlr.Com and their PIXLR Editor (the one with the butterfly). 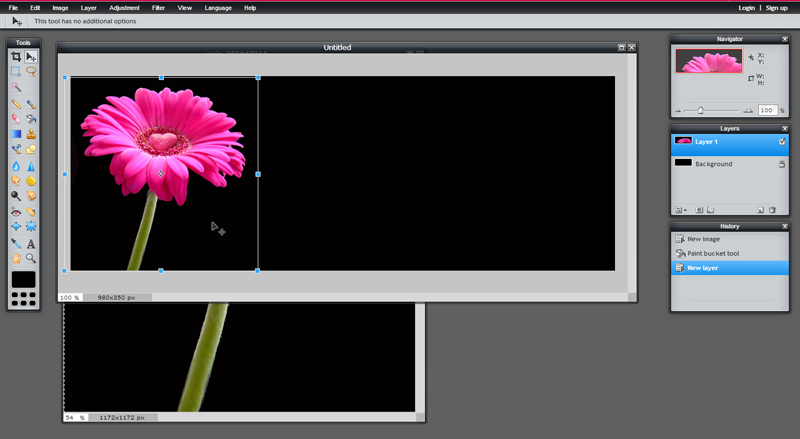 Pixlr is setup very similar to Photoshop without the insane price tag. In fact, it has no price tag because it's awesomely free. When you click on the editor, the first window you get is a list of options from Create a new image to Use pixlr on your mobile device. We're going to choose the first option: Create new image. Now you'll get a box with settings. Enter your image name, the width of your banner and your height. 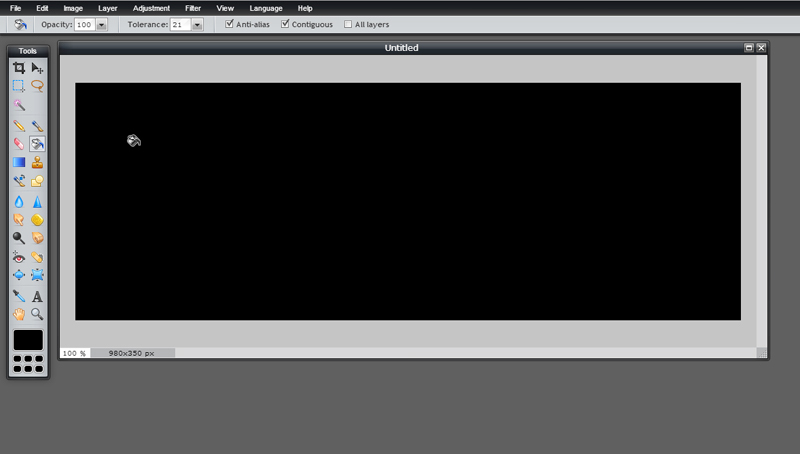 For the sake of this tutorial, we're going to say our banner needs to be 980 x 350 pixels. We'll enter that into the Width and Height boxes and click okay. Now you see your white banner. 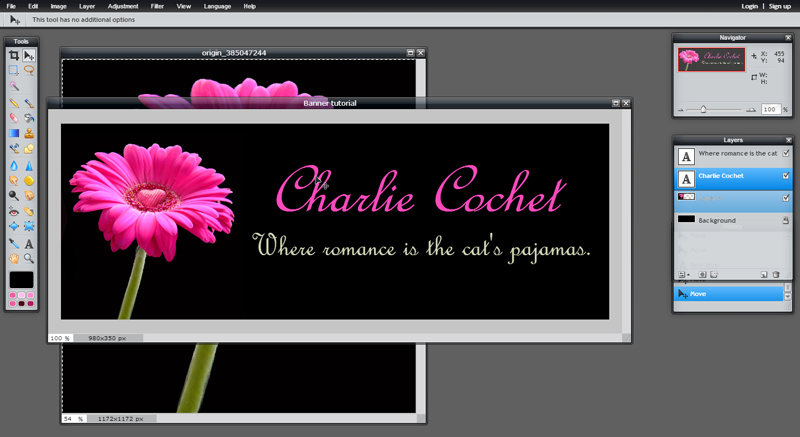 So this tutorial doesn't run super long, we're going to make a simple romance banner using free stock images from Photo Pin. Let's say the color theme of our website is black and pink. I went to Photo Pin and in the search box, typed in 'romance'. One image jumped out at me right away. Go to File > Open Image and find where you saved your image. It pops up in a new window. Learning keyboard shortcuts will make the whole process easier. But you can also do it through the menu at the top. Holding down the Ctrl button and hitting A will select the whole image. You'll see what one of my instructors used to call the 'line of ants' walking around all sides of your image. This means it's selected. Now hit Ctrl+C to copy the whole image. (You can also access these in the menu under Edit). Okay, your image is selected, now click the top of your banner to select it. Hit Ctrl + V. The image has been pasted onto the banner, but the high resolution means it's crazy big. We need to re-size that sucker. Hit Ctrl + T or go to Edit > Free Transform. 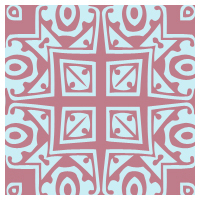 You'll see a white line with small blue boxes appear around the image's original size. When you move your cursor over one of those blue boxes, you'll see your cursor change. Hover over the top left blue box and hold down the Shift key as you drag the box to make the image smaller. Holding the Shift key means your image will retain it's proportions, so no warping or stretching the image. Here's what I re-sized it to and where I positioned it. Now double-click inside the image and it will transform to that size. If for some reason double-clicking doesn't work, just try to click on any other tool and a box will pop up asking you if you want to apply the changes. Click 'Yes'. Now I want to add my author name and tag line. Click the Text tool on the left which is the A and click on your banner. A text box will pop up. Let's do my name first, since I plan to make the tag line a smaller font. 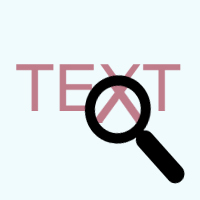 Type your text inside the Text box and on the bottom right, you'll see it'll let you choose your color. When you click the color, the color picker will pop up. You can choose a color inside your flower. 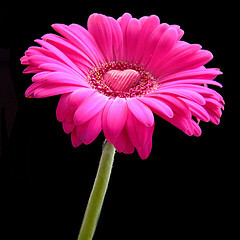 So position your eye-dropper over the flower and click anywhere. You'll see your text has changed color. Keep click inside your image until you find a hue you like. Click OK. Now you can change the font style and font size. Choose a font that fits with your sites theme. Make sure it's easy to read. I also chose Italics for the font. Now whatever font I choose, I'll be using in my other website graphics and author swag, to make it all look uniform. That's part of the process of branding. Once I'm done I click OK. Now with the arrow tool, you can position it to wherever you like. Following the same steps as above, I made my tagline smaller, and for the color, I clicked throughout the stem of the flower until I found just the right shade to match. It's all about coordination. Now you can add a little description if you want underneath. It's up to you. Like I said, this is a super easy banner. If you have a busy background on your site, try and keep your graphics and header banner simple. If you have a simple background, you can have busier graphics, though try not to put in too many images. Tip: When copy/pasting images with different backgrounds, try using the airbrush tool to airbrush sharp edges around the pasted image to give it a softer feel. Don't be afraid to use gradients. Tip: Limit the font types to two or three at most.